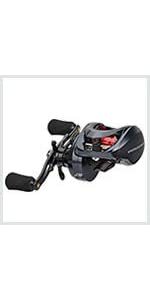 PERFORMANCE – Low profile design bait caster with low speed 5.3:1 gear ratio and precision cut brass gear for more torque and cranking performance. PROVEN ENDURANCE - 11 + 1 shielded MaxiDur corrosion resistant ball bearings for super smooth casting, retrieve, and long life. 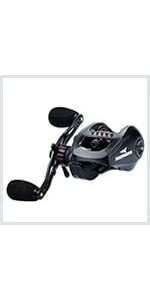 UNMATCHED – Four disc carbon fiber drag system delivering 17.5 LBs/8KG of drag offers the ultimate in a high performance low maintenance casting reel package. 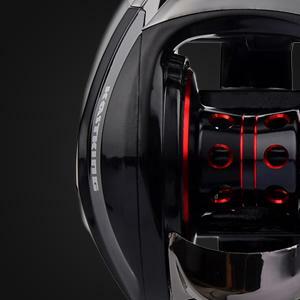 TOURNAMENT GRADE - The new KastKing WhiteMax bait caster fishing reels have state of the art dual brakes with a quick, easy to fine-tune reliable centrifugal brake and a seven magnet magnetic brake system for ultimate casting control. DYNAMIC - Brilliant anodized aluminum forged multi-ported whiffle-style spool offers maximum strength while reducing weight. Increased line capacity (12LB/165 YD). A Best-selling* Baitcasting Reel for a Reason! 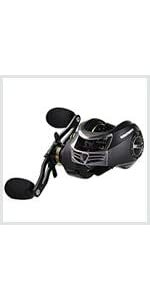 KastKing fishing reels offer you proven features for peak performance. Perfect baitcast reel for almost any fishing technique - pitching, flipping, casting, and more. KastKing Royale Legend baitcasters are affordable and fit every fishing budget. 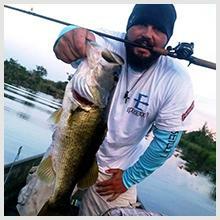 Perfect for bass fishing and other types of freshwater fishing. It is braided fishing line friendly. Super durability for more fishing fun. Super smooth operation allows you to cast the lightest lures. Sling to your heart’s content and it’s fish on. 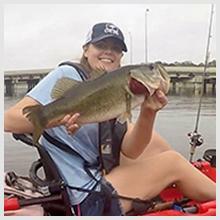 A perfect fishing buddy for your kayak fishing trip. Good manners and well behaved. It never complains. Whether you’re fishing the pre-spawn, fishing for sunnies on a sunny day, or dropping a line down the hole for ice fishing, KastKing Royale Legend baitcasters handles them all! KastKing's Royale Legend low profile baitcast fishing reel brings you maximum silky smooth performance without overpaying for your fishing tackle. This baitcaster features an easy to adjust centrifugal and magnetic 10-level dual brake system, helping you to achieve superior casting control and virtually eliminate backlash. Legend’s 7.0:1 brass gear ratio and 11+1 noise-free, corrosion resisting MaxiDur ball bearings, and ceramic line guide that is monofilament line and braided fishing line compatible, gives you optimal high-speed performance. These amazing fishing reels have oversized, stainless steel handles that gives you great control and non-slip EVA padded foam grips to wick away moisture and add comfort. The spool is composed of CNC machined, cross-drilled anodized aluminum. It's lightweight enough to use all day without leaving your wrist feeling fatigued, yet strong enough to deliver 17.5 Ib. of drag with its excellent no-nonsense carbon fiber star drag system. Royale Legend baitcasting reels are a perfect KastKing baitcasting fishing reel for bass fishing, trout fishing, ice fishing, and much more. 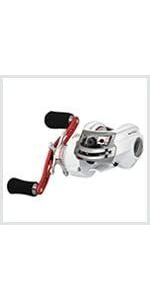 Although primarily a freshwater fishing reel, Royal Legend is corrosion resistant and may be used for saltwater with proper maintenance. 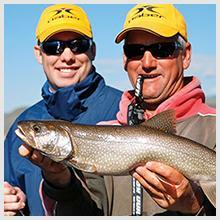 KastKing is an ICAST (International Convention of Allied Sportfishing Trades) award-winning brand. If you are holiday shopping for affordable fishing reels as a Thanksgiving Day gift, Christmas gift, choose a KastKing reel and save $100 or more compared to other brands that have less features. Any angler would love to add KastKing fishing reels to their fishing gear collection. One of the smoothest bait cast reels I've bought for the money. You won't be disappointed. The Royale Legend reel cast nice and smooth. I can get my line farther out than any other reel that I have tried so far. For the first time in my 73 years I can use a bait casting set up without fear of backlashes. 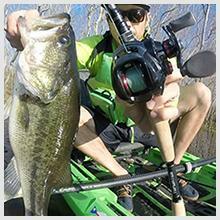 Adjusting the reel to the lure is easy and necessary to avoid backlash. Go on YouTube and search for videos on how to avoid backlashes. Particularly a video by Debo who uses KasKing products. Follow his instructions and practice, before long you find yourself not caring if you catch any fish you just enjoy casting with control. I Loved this reel its the best one I have ever used and has worked perfect for me and I would love to continue using it.